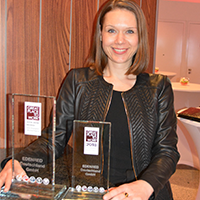 In addition to appearing in the Great Place to Work ranking in the category of companies with 101 to 250 employees, Edenred Germany received the Bronze "Trust Champion" award, which recognizes companies that have been ranked among the country's top 100 employers for five consecutive years. The Great Place to Work survey of employees evaluated the following criteria: respect, fairness, credibility, team spirit and pride. Edenred obtained above-average results for all the criteria. “Quite a few wheels are turning at Edenred Germany: products are being developed further, new markets opened up. This also means a lot of change for the employees in a relatively short time. I'm proud of what we have achieved so far and find it remarkable that despite this time of change, the results of the employee survey continue to be so pleasing. It shows that we have worked together on the right things in the last few years: namely corporate culture, employee motivation and leadership understanding." said Petra Muehlbauer, HR Director at Edenred Germany.